Fresh medium mushrooms covered in our house blend Yuengling beer batter served with our tangy horseradish sauce. Pickle sliced and lightly breaded then fried to perfection. Served with ranch dressing. Five crisp breaded mozzarella cheese sticks fried golden brown and served with marinara sauce. Fresh tortilla chips covered in queso and mixed cheese topped with shredded lettuce, chopped tomatoes and red onions. Served with jalapenos, salsa and sour cream. A new Southern classic, flavored bite sized chicken tenders hand breaded then fried to perfection, served with honey mustard. A flour tortilla stuffed with jack and cheddar cheese, served with jalapenos, sour cream and salsa. Side items listed as $3.99 are a $1.00 upcharge with a meal. Available after 5 pm Friday, Saturday, and Sunday. Chicken fingers over a generous portion of iceberg lettuce, cucumbers, tomatoes, onions, croutons, and mixed cheese with a choice of dressing. Chicken salad over a bed of crisp lettuce with tomatoes and cucumbers. A southern tradition, slow cooked smoked pulled pork or chicken. Slow cooked and fall off the bone tender. A combination of slow cooked ribs, pulled chicken and pulled pork. All choices come with one side. A savory chicken breast grilled to perfection and served on a toasted bun. Substitute fried for no additional cost. A half-pound of Certified Black Angus ground beef cooked to order. Served on a toasted bun with lettuce, tomato, red onion, and a pickle. Add American, Swiss, cheddar, pepperjack, provolone, bacon, mushroom, sauteed onions or jalapenos for an additional $.50 per item. Half pound patty of Certified Black Angus ground beef cooked to order and topped with sautéed onions and melted Swiss cheese on rye bread. Thin sliced corned beef with Swiss cheese, sauerkraut and 1000 Island dressing served on grilled rye bread. Thin sliced roasted certified angus beef with sauteed mushrooms, onions and provolone cheese served on a toasted hoagie roll. Substitute chicken for no additional cost. Thin sliced roasted certified Angus beef piled high on a hoagie roll with provolone cheese. Chicken with romaine lettuce, Parmesan cheese and croutons topped with Dillons House Caesar dressing wrapped in a flour tortilla. Four homemade meatballs on a hoagie roll with marinara sauce and melted provolone cheese. Savory fried shrimp on a hoagie over a bed of chopped lettuce and tomato, topped with Dillons Cajun rémoulade sauce. 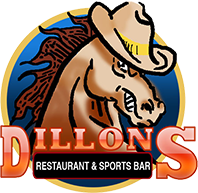 A delicious take on Dillons classic barbeque, smoked pulled chicken or pulled pork on a toasted garlic bun. Served on Texas Toast or wrap with lettuce and tomato. Two large chili cheese dogs. *Items Marked with an asterisk may be served raw or undercooked; consuming raw or undercooked meats, poultry, seafood, shellfish, or eggs may increase your risk of foodborne illness; especially if you have certainmedical conditions.